MHL stands for - Mobile High-Definition Link and is a technology found in many devices, displays and accessories today. MHL-enabled smartphones and tablets connect to HD displays, delivering HD content and immersive surround sound, while simultaneously charging the phone. The MHL Consortium is comprised of Nokia Corporation, Samsung Electronics Co., Ltd., Silicon Image Inc., Sony Corporation, and Toshiba Corporation. 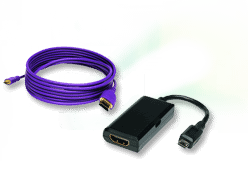 The MHL specification is an HD video and digital audio interface for connecting mobile phones and portable devices to HDTVs and other home entertainment products. 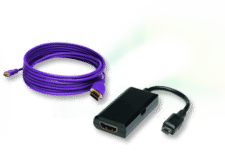 It utilizes established connectors and features a single cable with a 5-pin interface, supports 1080p HD video and digital audio and simultaneously provides power to the mobile device. It also enables the TV remote to control the mobile phone and access its contents.